Workers at the Los Angeles Times are unionizing not just to improve their working conditions but to ensure the future of the paper. Earlier this month, employees arrived at their desks to find flyers announcing that “a majority of the newsroom has already signed [union] cards.” While the old Los Angeles Times building was blown-up, with twenty-one people killed, in 1910 by a radical hoping to attack the then-diehard antiunion paper, today’s Times workers are unionizing. Tronc, the ghastly new name of the paper’s parent company (previously Tribune Publishing), responded to the announcement by intensifying its ongoing antiunion campaign. So impatient were the bosses to get their message out, they forgot to edit the generic language, leaving it to read: “you could be STUCK with the [Union].” Wherever tronc got its materials, its message was clear: it would not give in without a fight. The workers hope to pressure tronc into voluntarily recognizing the union, but they are prepared to hold a union election if they must. The Times employees have chosen to work with the News Guild, which represents outlets such as the New York Times, Washington Post, and Wall Street Journal (as well as Jacobin). Jacobin’s assistant editor Alex N. Press spoke with Kristina Bui, a copy editor, Anthony Pesce, a data analyst, and Matt Pearce, a national reporter, about the campaign. Media outlets often theatrically announce their union organizing drives. Most memorably, Gawker went public with an article titled “Why We’ve Decided to Organize.” You chose to leave flyers on everyone’s desks. Why did you go public, and what were months of underground organizing like before this decision? We started talking about unionizing in December 2016, which is when we initially reached out to the News Guild. The early process was very slow. It took us a few months to adjust to the idea of unionizing and to talk to a handful of close friends in the newsroom and then move out from there. So we started in December but we really kicked off in earnest at the end of April or early May. We went public because we have the support of the majority of the newsroom, and we think it’s time to gear up and move on to the next stages of the process. I got involved around April. A lot of our efforts in that time have involved figuring out the structure of the paper and all its nooks and crannies. Many other recent campaigns at media outlets, largely digital ones, are substantially smaller; at the Times, the bargaining unit is at least several hundred people, and there are a ton of different departments. For example, today we were talking to a sports reporter and had to show him where the sports department was because he hadn’t been there in two years. So trying to root out who works here, where they work, what they do, and whether they’re a staffer or a contractor has taken a lot of effort. Another difference between us and many digital publications is that we have people who have been here for twenty or thirty years. They have long tenure, long institutional memories, and they’re concerned about seniority. The other thing that’s unique about the Los Angeles job market is that there’s less room for lateral or upward movement. If you’re in New York, you can hop around between publications, and that’s a good way to boost your income. 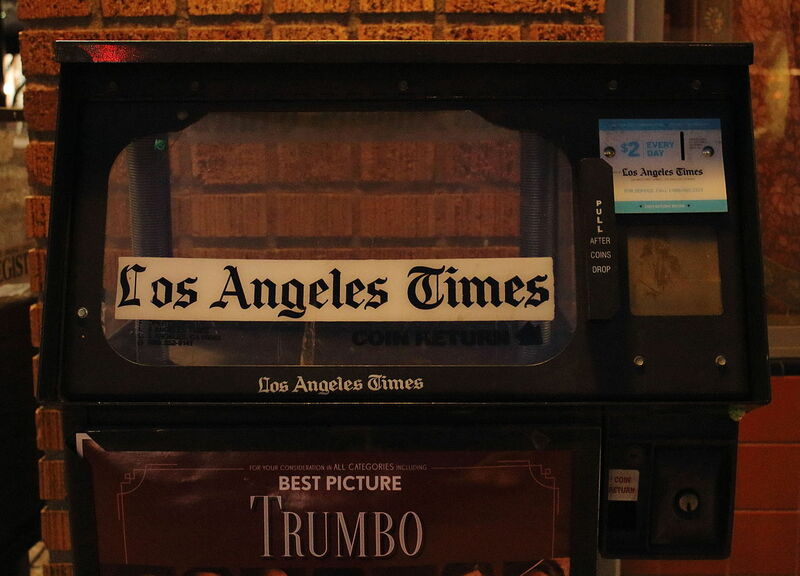 In Los Angeles, once you hit the Times, there aren’t a lot of options to move around. On top of all this, we’re pretty much the only newspaper of our class that is not unionized, and that’s a product of the history of the Times and the history of Los Angeles itself. We’re a major part of how this city was created, and antiunion politics was central to that history. What were the original issues that drove you to start unionizing? There were rumors of a digital reorganization. That never materialized, but it was worrisome at the time. They also took away accrued vacation for the salaried staff. People were banking their vacation so that if they got laid off, got another job, or something happened, the company would have to cut them a check for any unused time off. People would get a check for a couple grand. The company took that away from the salaried employees — the hourly employees still accrue their vacation — and that was very frustrating for the newsroom. We felt like we didn’t have a cushion anymore. It was also an environment where we hadn’t gotten a raise in years. Prior to a 2.5 percent raise last year, we think our last staff-wide raise was in 2009 or 2010. It’s been tough. We’ve had a lot of turnover in our executive suites, both at our parent company and our publisher’s office. With all of that turnover, we know that priorities change and new strategies emerge: it’s time for us to step up and be our own advocates. We want our own seat at the table, and to take our futures into our own hands. The newsroom staff is the only thing that’s been consistent about the newsroom for a very long time. To be a part of decision-making is about being sure that our priorities stay the same, and are heard and represented, regardless of who is in charge. Your editor-in-chief changed during this organizing campaign. How has that influenced the process? It’s a distraction for us. You’re in an organizing drive, and there’s some upheaval, and people are dealing with that, making it the focus of the newsroom. So maybe we could have progressed more quickly, but this isn’t about one editor or one boss. The organizing drive isn’t about one person, or even one policy or one decision: the prospect of a new editor underscores the importance of having an institutional seat at the table. Your letter from earlier this week says you have “a simple goal in mind: to safeguard the future of the LA Times and improve newsroom decisions.” One thing a lot of media workers worry about when unionizing is the idea that the union will oppose “the future of” their publication. You’re flipping that fear on its head, seeing the union as key to ensuring the LA Times’s future. If we were in this for the money, we’d be doing something else. People work here because they still hold to the romance of the paper: when you tell people you’re with the Times, you can get a US Senator to call you back. So “legacy” and “tradition” are taken seriously here. In the five years I’ve worked here, I’ve had five publishers; I’ve already outlasted four of them. When you look back on the past fifteen or twenty years, the culture of this organization and its prestige has been kept alive by the workers and the journalists, many of whom feel as if they’ve been forgotten about by the owners. It feels honorable when we break investigations or cover things like the San Bernardino shooting. We’re providing a public service and it’s important. So lots of us have an emotional attachment to the paper and want to see it succeed, and that’s an animating desire for us to create a force in the newsroom to preserve this culture. When I showed up in 2012, there were people around who had been working here for twenty-five or thirty-five years, who remember the golden days when the paper was so profitable that we were practically printing money. As the story goes, the print edition was so fat that a delivery boy killed a woman’s dog when he threw it out of his window. These stories about the Times lend it a grandeur, but the reality is a series of incredibly bad corporate decisions over the past ten or fifteen years were made, none of which were in the interest of the readers. Whether it was pumping us full of debt or selling the building out from under us and taking our assets away, none of these decisions were made in the interest of preserving the culture of ambitious journalism that had been cultivated at the paper for decades. These decisions were made in the interests of wealthy owners and shareholders who wanted to pursue their profit through the company, but were less interested in preserving the product and nurturing the workforce so they could keep producing the product that was making them so much money. It’s like this: the owner of the mine is going to care about the mine, while the mineworkers doing the work understand what they’re facing. It doesn’t make sense for us to work against our interests. Especially when you have so much turnover at the top, the knowledge that you have would be really important for the institution. So, we want to make people feel invested in, and that they have a path to earning a little bit more money, and that they know where they’ll be in a few years. Even a couple years of incremental pay increases would be amazing and would help with retention. In journalism, there’s pressure to focus on individual advancement and to maintain strong personal relationships with specific editors. Has that been a source of doubt about unionizing among your coworkers? We’ve encountered doubt because of the misinformation the company is putting out about exactly what you referenced earlier: the idea that the union is antagonistic or creating a bureaucracy. That’s certainly information that we have to counter. The LA Times has been historically antiunion, and there’s never been a union in the newsroom. So, a lot of people here have never worked for a union paper. So we’re educating people. Early on there were concerns. We talk a lot about pay minimums in a contract, and a lot of folks were concerned that we’d set pay maximums as well. We have a lot of big names as columnists, and people want to see a future where they can have a role like that and are able to negotiate on their own for a much higher salary. But contracts provide pay minimums, not maximums, and once we tell people their pay won’t be cut and that they’ll maintain the ability to advocate for pay raises in the future, most folks are comfortable. Surely not everyone in the newsroom was immediately on board with the union. The word “immediately” is a good one: a lot of the people here, including myself, have zero experience with unions, so it’s an alien concept. It wasn’t a natural thing for me to want to be in a union. I feel so grateful for the opportunity to work at the Times, but a lot of the organizing drive has been about hearing people’s complaints. I hear stories about people getting low wages and little time off. I hear from older employees who have been here for a while and feel that they were really well paid when they got hired, but after seven years without a raise, they’re starting to dip into their savings so they can keep working their jobs. That’s not sustainable. When I talk to people about this, a lot of the hesitancy comes from people not having experience unionizing before and not understanding the collective-bargaining process. Some people want to see a contract before they vote to support the union, but we can’t shape a contract before getting input from everyone in the bargaining unit. So while this is union 101 — and I had to teach myself these basics too — much of the organizing process is about communicating that information to others. To the extent that we’ve encountered resistance, it’s been about the need to acclimate people to the idea of a union in the first place. It’s been baked into the DNA of the organization since 1881 that the Times keeps unions out, and that was effective for 135 years. You’ve referenced the antiunion campaign tronc has been running, and I remember seeing photos of flyers management left on people’s desks. Did that start right after you went public? The flyers came before we went public but after we started collecting cards. Why do you think tronc launched such an overt antiunion campaign — has it had an effect on the newsroom? It’s too early to judge, but I’m encouraged: the more they fight us, the more that tells me they have a financial incentive in this game, and that if we win, they’re going to have to pay us more. There are arguments about how union publications don’t have it as good as we do, but if that were true, they wouldn’t be fighting us at all. I couldn’t hazard even a guess why they decided to launch such a public antiunion campaign. Obviously, we’d prefer it if they voluntarily recognized us, since that way we could avoid any public rhetoric and move straight to the bargaining table. So it seems unlikely that they’ll recognize your union? We’re going to ask for recognition, and we hope that they agree to that. We want to give them an opportunity to do the right thing and to voluntarily recognize us. But we’re certainly prepared to file for an election. At their best, unions aren’t just about securing a contract. Have there been discussions about what comes after you win and what comes after a contract? Right now we’re focused on where we’re at in the campaign: getting even more support, getting voluntary recognition, and then getting to the table. When it comes to the contract, we want to get a survey in front of the entire newsroom, elect a bargaining committee, and that will determine our priorities. It’s a lot of work to stay focused on that, so we haven’t had much time to envision what the union might look like after the contract. We’re moving one step at a time right now. How has the experience of organizing a workplace with your coworkers been? I’ve met more people in the newsroom throughout this process than I did in the eight or nine years that I’ve been at the paper. That has been super rewarding. We’ve had better working relationships, more story ideas, and more ideas for collaboration. That part has been amazing, and even the atmosphere in the newsroom has changed. It’s been great. A lot of the newspaper is siloed off. I sit in a cubicle in the corner of the newsroom, and it’s normal for me not to move around and talk to other people outside of my tiny corner of the Times universe. We didn’t have company outings or social events. It’s not as if we have ping-pong tables in the room; we’re not cool. So aside from the material benefit that will come from the union process, it is as if a social structure has been installed in the newsroom to create camaraderie that didn’t exist before. The process of unionizing forces us to talk to people. It’s been an amazing way to get to know my coworkers, which sounds hard to believe since I’ve been working here for five years. It really has been beautiful. You get caught in the bubble of your department, but now I know so many people from other departments, and I can look at them and say: I’ve got your back and you’ve got mine. Kristina Bui is a copy editor at the Los Angeles Times. Anthony Pesce works at the data desk at the Los Angeles Times, doing data analysis and visualization. Matt Pearce is a national reporter at the Los Angeles Times.